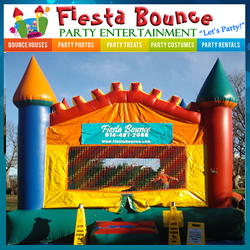 Fiesta Bounce Party Entertainment is your source for party rentals, concession machines, and of course our specialty, bounce houses! Our selection of bounce houses include The Birthday Cake Bouncer, Princess Bouncy Castle, The Magical Wizard Moonwalk, Colorful Castle Bounce House and Rainbow Bouncy House with attached 12 foot inflatable slide. Star-Walk Entertainment has been in the party rental industry since 1991. We offer inflatable party rental equipment for SW Missouri & NW Arkansas from a simple moonwalk to a complete turn key company picnic and everything in between! We have a HUGE selection of Inflatable Games and Interactives. We guarantee that our prices and services cannot be beat! Our staff at Star-Walk Entertainment can help plan your custom event or choose from standard packages. They include interactive inflatables, moonwalks, water activities, inflatable slides, slip n slide, carnival & field games and even prizes for most any event. Check with us to see if we can help you with your event. Our schedule fills up fast so call soon! …We bring fun to your event, which is why our business is always jumping!